In front of an energetic Arizona crowd, PBR’s (Professional Bull Riders) Fabiano Vieira (Perola, Brazil) won his first 15/15 Bucking Battle of the 2018 season at The 25th PBR: Unleash The Beast, Ak-Chin Invitational, presented by Cooper Tires, at Gila River Arena in Glendale. Vieira rode Rising Sun (Dakota Rodeo/Chad Berger/Clay Struve/Heald Pro Bulls/Floyd Bucking Bulls) for 90.25 points to win the special round of competition. Starting the evening at No. 24 in the world standings, Vieira’s impressive ride moved him up to two spots. For his effort, he gained 150 world points and a $11,500 paycheck. As the only other rider in the 15/15 to record a qualified ride, Kaique Pachecho (Itatiba, Brazil) took second place in the round after riding Twinkle Toes (Broken Arrow Bucking Bulls) for 87.25 points. Pacheco dominated the first two 15/15 matchups earlier this year. Friday night’s ride moved him from No. 21 in the world standings to No. 18. Pacheco took home 90 world points and $9,500. Canadian Dakota Buttar (Kindersley, Canada) earned his second round win of the season by winning Round 1 in Glendale earlier in the evening after delivering an 87.5-point ride aboard Sid’s Wish (PK Triplett Bucking Bulls). Ending the night tied with Vieira at No. 22 in the world standings, Buttar gained 100 world points and pocketed $3,580. Chase Robbins (Marsing, Idaho) finished in second place on Friday night with an 87-point ride aboard Trouble Maker (JD Nix Rodeo Co.). Robbins gained 60 world points and a $2,750 paycheck. 2017 Rookie of the Year Jose Vitor Leme (Ribas du Rio Pardo, Brazil) finished in fourth place and moved from No. 10 in the world standings to No. 8 with an 86.5-point ride on Money Talks (D&H Cattle/Buck Cattle/ Tommy Julian). Leme picks up 40 world points and a $1,300 paycheck. Rounding out the Top 5 in Friday’s Round 1 was Eduardo Aparecido(Gouvelandia, Brazil) as he turned in an 86-point trip aboard Mortimer (Julio Moreno/ Dallas Schott). 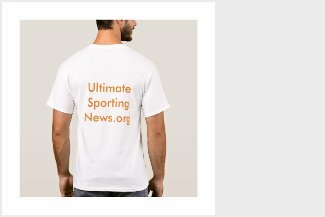 Aparecido gained 30 world points and pocketed $850. 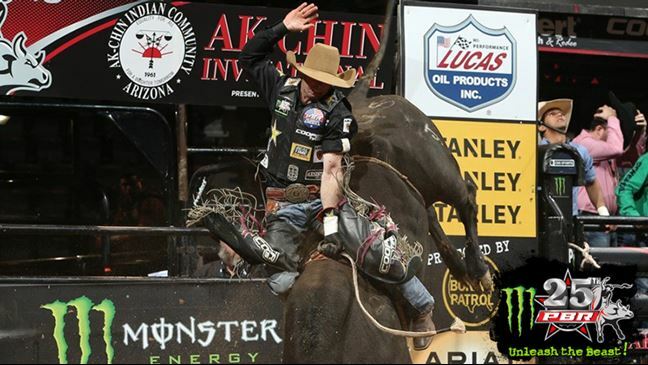 The best bull riders in the world will return to Gila River Arena on Saturday, March 24 for Round 2 and the Championship Round of the Ak-Chin Invitational. Event Leaders (Round 1-Round 2-Round 3-Round 4-Event Aggregate-Event Points)1. Dakota Buttar, 87.5-0-0-87.50-100 Points. 2. Chase Robbins, 87-0-0-87.00-60 Points. 3. Kaique Pacheco, 86.75-0-0-86.75-50 Points. 4. Jose Vitor Leme, 86.5-0-0-86.50-40 Points. 5. Eduardo Aparecido, 86-0-0-86.00-30 Points. 6. 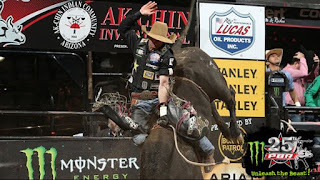 J.B. Mauney, 85.75-0-0-85.75-10 Points. (tie). Brady Oleson, 85.75-0-0-85.75-10 Points.